This summer has been one with lots of travel in it. And now we are once again on a whirlwind tour of Southern California. The picture is a map of our route. and finally back to Santa Cruz. All in about 12 days. Well over 1500 miles on our poor van. 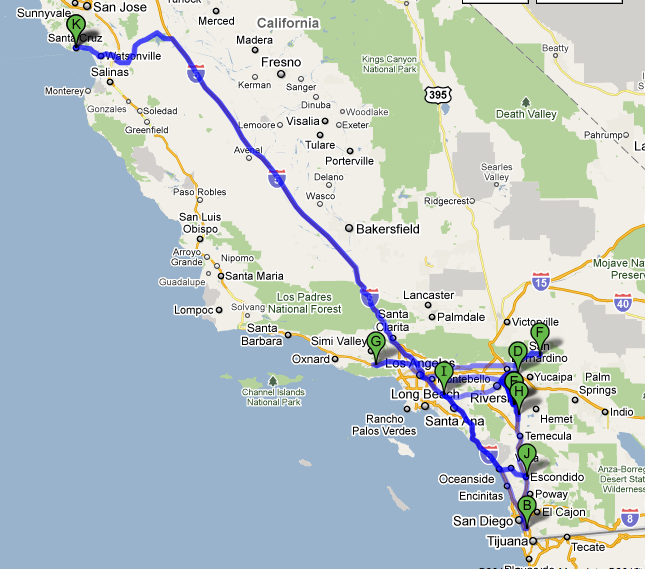 1 day and 3 hours of it in the car, according to Google (make that up to 1 day 13 hours in traffic). We’re currently about to leave Big Bear for my half-brother’s place in Agoura. A lot of friends wished us an enjoyable vacation. Actually, the trip is about half pleasure, half workin. Rachel’s cousin got married (one of the most fun weddings I’ve been to-congrats Kim & Ben! ), we spent a little time with her parents in Big Bear, we’ll get to stop in with a few other family members, and at the end we get a few days with my family on their vacation. The work part…lots of support raising being worked into there while we’re in the area. Primarily the reason for so many stops. Starting a new church in Santa Cruz means we need to put in some time on the front end raising financial support to provide our salary, as well as a bit to supplement the giving of our Missio Dei peeps for ministry budget. Just like missionaries are supported by those who believe in what they’re doing, so are we. Right now we are about 46% of the way to our goal for support raising. The whole process is an interesting one. Meeting with friends and family to share our excitement about what God’s doing and inviting them in on the opportunity to be a part of making it happen. Some weeks it’s an incredible blessing as we get to connect with people we love and share our journey. Other weeks are more discouraging. But we keep trusting that God will provide and keep on doing what we need to do. All that to say I’m looking forward to more opportunities this week to see people and share the need and the opportunity, even if all the traveling will be a bit tiring. I was able to lead worship at Rancho Vista Church last Sunday and share briefly what we were doing. People were invited to give on the way out. This Sunday I’m stoked to lead worship at our past home, Revolution Church, and get to share with that family how they have been so tied to our journey. And then a few days of R&R with Lawrence Welk in Escondido before returning to the daily routine…wait…nevermind. Routine doesn’t really exist for us in this stage of life. And for the most part, I love that. Rachel, on the other hand, is probably a bigger fan of routine. So that’s what’s going on with us this month and this summer. Good thing our kids are learning to travel well in the car! How’s the end of your summer shaping up? We might see you this Sunday at Revolution!!! Do you have lunch plans?